GAMING BITS | Board and Card Game reviews – Gaming thoughts and reviews from a veteran gamer. 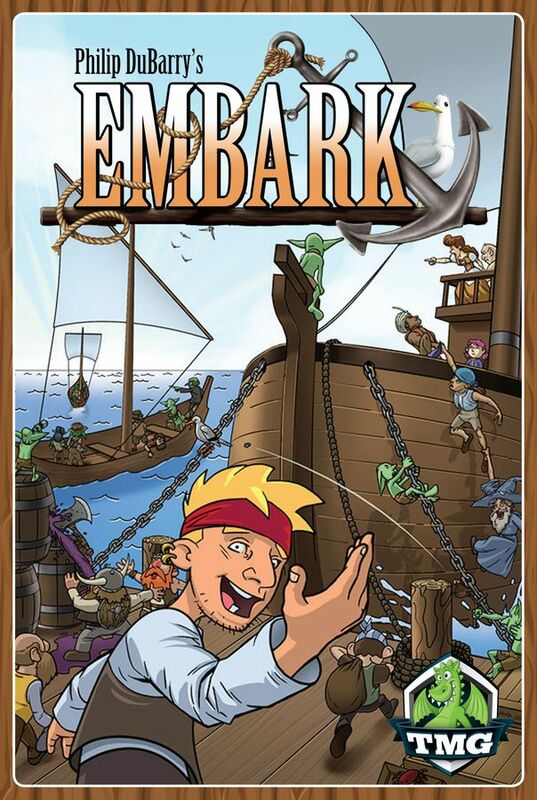 Embark is a game by Philip duBarry, published by Tasty Minstrel Games. It is for 2-5 players. 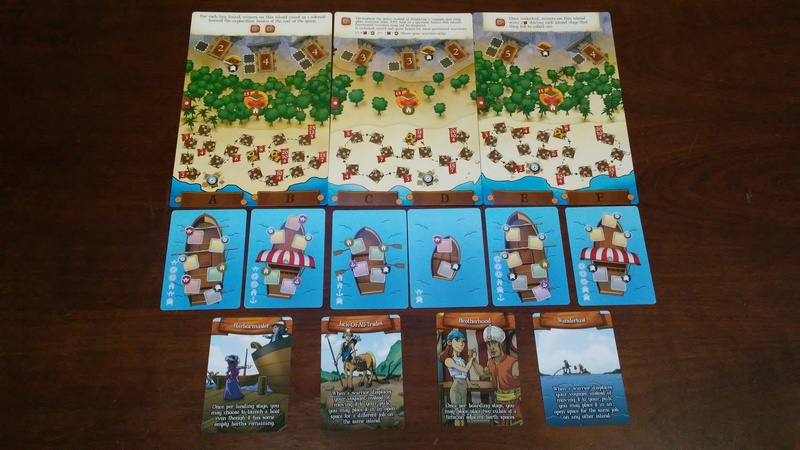 In this game, players will be loading boats full of voyagers to explore, colonize and mine newly discovered and uninhabited islands. They’ll be unlocking mysteries, collecting ore and cultivating farms in order to reap all the benefits the islands have to offer. Of course, they’ll have to be careful as warriors from their opponent’s ships will try to take their place on the island and thus reap the benefits themselves. In the end, the player that can accrue the most victory points will be declared the winner. To begin, the Island boards are shuffled and placed in the middle of the play area on either side. There should only be as many Island boards as there are players and each board is placed in alphabetical order. The Victory Point tokens are placed in a pile near the middle of the play area. The Farm tiles are set aside for the time being. One Key token is placed on each spot marked with a key on the Exploration tracks of each Island board. The Boat cards are shuffled together. A Boat card is then dealt out to each lettered slot below the Island boards. The remaining deck is placed face down nearby. A number of Ore tokens are stacked on each ore space on the island boards. The number of tokens is based on the number on the space. 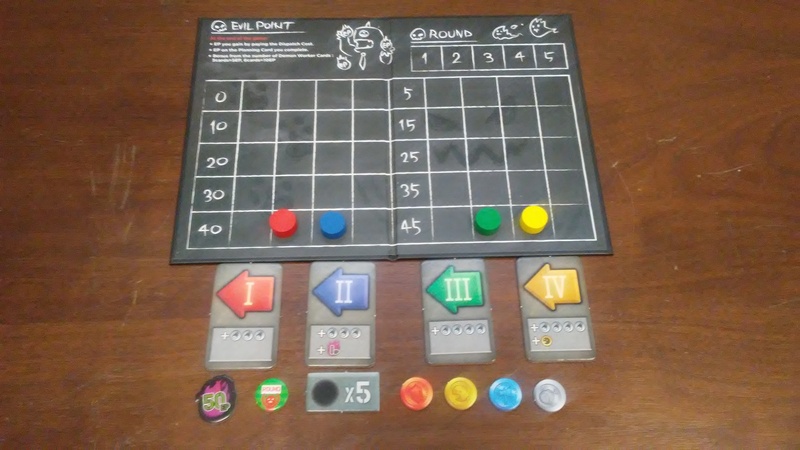 Each player chooses a color and is given a Player board and Player Screen in their player color which will be set up in front of them. Each player is also given 30 Voyager cubes that matches their player color. The first player is chosen and is given the First Player token. The Talent cards are shuffled together and a number of them are revealed to all players. That number is equal to the number of players plus 2. The remaining cards are returned to the box. Beginning with the player to the right of the first player and continuing in reverse turn order, each player will take turns choosing a Talent card to use in the game. Any left over cards are also returned to the box. Once this is done, play now begins. The game is played over 6 rounds. Each round is divided into 4 stages; Allocation stage, Boarding stage, Landing stage and Island stage. The first stage is the Allocation stage. In this stage, each player will take 5 of their Voyager cubes, along with any cubes in their pub, and place them on their player board, assigning them to the various boats that are available. These cubes can be placed to the same boat or to any combination of boats. Once each player has completed this task, everyone will remove their player screen and move their voyagers to the area beneath each corresponding boat card. This would mean, for example, any cubes on the A space of a player’s board would then go beneath the boat card below the A space on the Island board. It should be noted, if a player placed a cube on the wrong lettered space, that is to say one of the lettered spaces not being used in this game, those cubes are placed in the player’s pub. The next stage is the Boarding stage. In this stage, players will take turns moving a Voyager from below a boat into an open job space on the boat. This is done in turn order beginning with the first player. 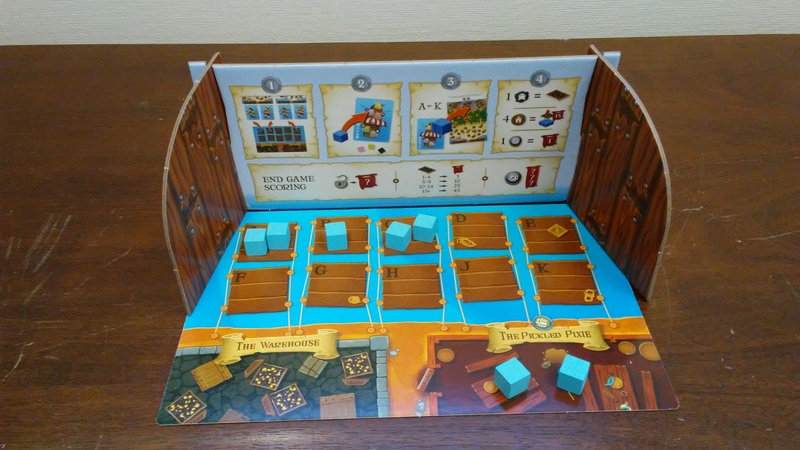 Once a boat is filled, any remaining Voyagers below that boat are placed in the respective player’s pub. It should be noted that some Talent cards will grant the ability to move a Voyager to another boat. Once all the Voyagers have been loaded or returned to the player’s pub, play moves to the next stage. The third stage is the Landing stage. In this stage, completely filled boats will set sail to the island and get unloaded. Filled boats are unloaded from A to K, in alphabetical order. Each boat is unloaded from front to back. Voyagers are moved to the island according to their job. Voyagers can have 1 of 5 jobs. Those jobs are Colonist, Explorer, Miner, Captain and Warrior. Colonists are placed in the farming area in the center of the island. Explorers are placed on the first available space of the Exploration track in the Exploration area. Miners are placed in the Mining area of the island in an empty mining space of the player’s choice. Captains can be placed in either an empty space for a Colonist, Explorer or Miner space. Warriors can remove a previously placed Voyager from their spot, sending them to that player’s pub. It should be noted though that a Warrior can not remove a Colonist that has already built a farm. Once all the Voyagers on a boat have been unloaded, the Boat card is placed at the bottom of the deck. Once all Landings have been completed, any empty boat spaces are refilled with a card from the top of the deck. The last stage is the Island stage. In this stage, players will use their Voyagers to Explore, Farm and Mine. The player will score 1 victory point for each Explorer they have on each island. For each group of 4 Colonists that a player has on an island, they are able to place a farm tile on top of it and score 15 victory points. These Colonists are then unable to be moved and become immune to Warriors for the rest of the game. The player will collect 1 Ore token from the ore space adjacent to each of their Miners. If the mine is empty, the Miner does nothing. Once Exploration, Farming and Mining are complete, the stage ends. The first player token is passed to the next player in turn order. If this isn’t the end of the 6th round, a new round begins starting with the Allocation Stage. If this is the end of the 6th round, the game ends. At the end of the 6th round, each player will return all the Voyagers on boats that did not land in the final round to their pub. Players are then awarded end game bonuses for any unlocked Island bonuses and mining bonuses for their ore tokens. Players are also awarded exploration bonuses for the furthest flag reached for each island. The player with the most Colonists on the island scores the 1st place exploration bonus, while the 2nd and 3rd place bonuses go to the next 2 players with the most Colonists. Once all bonuses are awarded, players add up all their victory points and the one with the most is the winner. This is a really light hearted and fun looking game that’s full of cardboard pieces. There are victory point tokens that are numbered red flags. There are farm tiles that look like rows of corn and tomatoes. There are key/unlock tokens that have a key on one side and an open lock on the other. There are ore tokens that look like gold and coal. There’s the first player token that looks like the wooden helm of a ship. There are player screens that when assembled have what looks like wooden sides on them. The side facing the other players is the player’s color with the game’s logo, while the side facing the player has an end game scoring reference. All these pieces are pretty good quality and quite thick cardboard. I think as far as cardboard pieces go, they’re pretty cool looking. I especially like the first player marker and the player screens. Speaking of player colors, there are wooden cubes in 5 player colors, enough for each player to have 30 cubes. That’s 150 cubes total. I will say that I wish these had been meeples instead of cubes. I just think it would have been more fun to place meeples instead of cubes. Finally there are the cards and the island boards. There are 2 types of cards, Boat cards and Talent cards. The Boat cards are just that, boats with spaces for cubes to be placed. Each colored space indicates a job type. The Talent cards are more reminiscent of Harbour and have the same type of look and feel as the artwork in that game. I really like the Talent cards artwork, especially since I really enjoy the art from Harbour. The island boards are pretty cool too. They have different section on them for each type of voyager. I do wish these were a little more sturdy but as they don’t get moved around too much, they get the job done. All in all, this is a pretty cool looking game. The box is a bit bigger than the one for Harbour but it’s not so large that it’s going to take up a ton of room on the shelf. That said, I feel I do need to mention a couple of negatives. Since the box isn’t all that big, it’s a bit of a pain to put everything back into the box. Basically you have to assemble the player screens to play the game and then disassemble them to put them back in the box. I realize that you’d have had to have a huge box to not need to do this, so I get it. Still it’s a bit of a pain. Of course the biggest pain is that the game came with nothing to keep all those tokens in. A couple of ziplock baggies of some kind would have been nice. Instead I had to supply my own to keep everything from going all over the place and getting mixed together. Before you ask, yes I was one of those kids that couldn’t have my food touching on the plate. Who wants bean juice in their mashed potatoes? Nobody! Ok, rant over. Overall the game looks good. Harbour fans will enjoy the artistic designs here. The rulebook for this game is pretty good as well. There are plenty of pictures throughout the book. However there really weren’t any gameplay examples anywhere to be found. Not that the game is difficult to understand, because it’s not. I just like to see an example or two in every rulebook just to be clear on a possible misunderstood rule or two. The book isn’t that big so it’s not like it takes a whole lot of time to read through. Everything seemed fairly easy to understand, so I didn’t see any problems there. Everything seemed fairly streamlined and step by step, apart from maybe the setup. That was a bit of a jumble but nothing that couldn’t be figured out. I will say that I’m glad that the player screens have a scoring reference on them. It makes things a lot easier for the end of the game and help players understand what they need to be shooting for to get the most points. Overall I think the book does a good job of conveying the rules in precise and concise way. I’m fairly pleased with it. This is a really fun game full of adventure and exploration. As a fan of the designer’s previous game Harbour, I went into this one with high hopes. I liked the hidden action selection of the Allocation stage. Trying to determine what your opponents will choose versus what you think they will think you chose, all while trying to get the best options for yourself can be quite enjoyable. Many times I found myself overthinking things and realized that some players simply go for what they think they can get. Of course others will simply try to take every option away from you so that you don’t have a really good choice. Once you’ve got your cubes out there, you’re moving into the actual selection process. If you made some good choices, then you have plenty of spaces to put your voyager cubes in order to get lots of points. If not, you may have to choose what you think will garner you the most points on the boat that you’re loading up. Choosing the right job can be crucial. Speaking of jobs, I found that I was overly fond of the warrior role. In 2 player games, it simply feels like you’re going back and forth. One minute I’m taking your spot on the board, the next minute you’re taking mine. The back and forth with this player count wasn’t all that fun. Of course you add another player or two and that changes. With our games, we found ourselves making alliances and cutting deals so that we could minimize the damage to ourselves from those warriors. Ideally, that’s the way to play if you ask me. The more players, the more fun this game is. I will say that I’ve never played anything quite like this before, although it does remind me of a game I saw on Kickstarter that I really wanted to try. The same mechanic of hidden action selection is present in it as well. That game is Guild Master. I think players that enjoy the mechanics of that one, may enjoy this one as well. This is a game that I would recommend, as long as you’re not looking to play it simply as a 2 player game. That’s where it falls flat in my opinion. Otherwise is a good solid game that you can negotiate and bargain while exploring, farming and mining on uncharted islands. It’s a good game that’s family friendly and is easy to learn. I can say that I like this one rather well. Embark is a game of exploration, farming, mining and take that in the same world as the game, Harbour. The game doesn’t take too long. Most game sessions last around 45 minutes to an hour. The components are really good. I love the artwork for the cards and all the tokens. I do wish there had been some baggies or someway to store the pieces better inside the box. I also wish that the player screens didn’t have to be taken apart after every game. The rulebook is also quite good. Everything is stream lined and easy to read and understand. I do wish there had been a few examples of gameplay however. The game itself is fun, as long as you’re not planning on playing with only 2 players. The back and forth take that aspect of the warriors is a bit annoying. With 3 or more players though, the game takes on a whole new life. The negotiations, alliances and down right begging make for a very fun dynamic for using the warriors. This is a fun family friendly game that is enjoyed best with more players. Fans of hidden action selection games like Guild Master or others of that nature may enjoy this one as well. This is a game that I would recommend for playing with more than 2 players. Set sail on a game full of fun. Sailor Moon Crystal: Dice Challenge – Season III is an expansion for Sailor Moon Crystal: Dice Challenge by James Ernest, Mark MacKinnon and Robert McLarney, published by Dyskami Publishing Company. It is for 2-8 players. This expansion adds 12 new character cards and 4 new challenge cards, along with lots of dice and tokens. 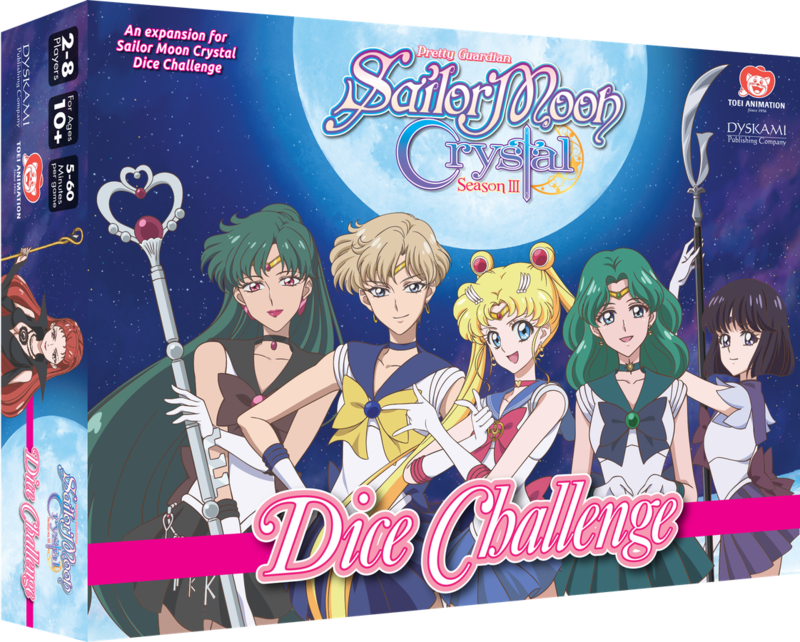 For more information on Sailor Moon Crystal: Dice Challenge and how to play the game, please check out the link below. Setting up the game with this expansion, is exactly the same. All that needs to be done is to follow the same basic setup rules from the main game’s rulebook. So what does this new expansion bring to the table as far as content goes? Well, as I mentioned earlier, there are 12 new playable characters. Those characters are Sailor Uranus, Sailor Neptune, Sailor Pluto, Sailor Saturn and Luna P. There’s also Kaolinite, Eudial, Mimete, Viluy, Tellu, Cyprine & Ptilol and Mistress 9. These new characters have special abilities, some of which are shared by certain characters. For instance, Sailor Uranus, Neptune and Pluto all share the Talisman Power which allows them to lock one of their opponent’s dice through their next turn after rolling or rerolling their dice for an attack. Another new special ability is shared by Eudial, Mimete, Viluy and Tellu. It’s called Summon Daimon. This ability allows them to summon a powerful Daimon to aid them in battle. This ability can only be used if the player has at least two or more dice in play. 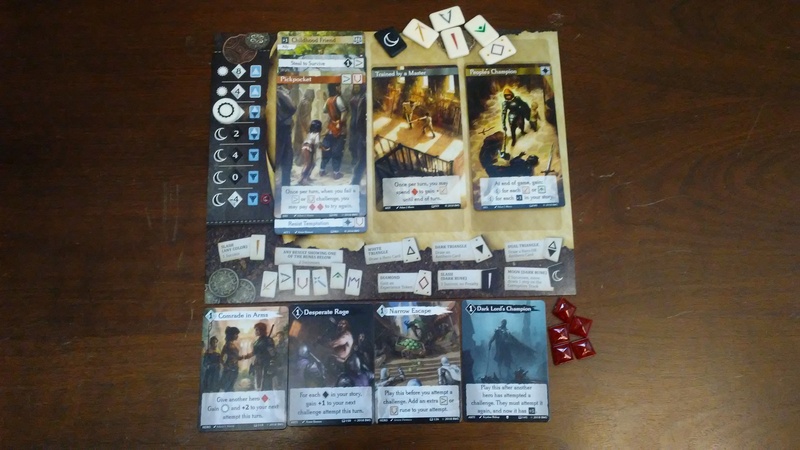 Before attacking the player converts their die with the highest value showing into a Reserve die. This die is then placed in the player’s pile of Reserve dice. 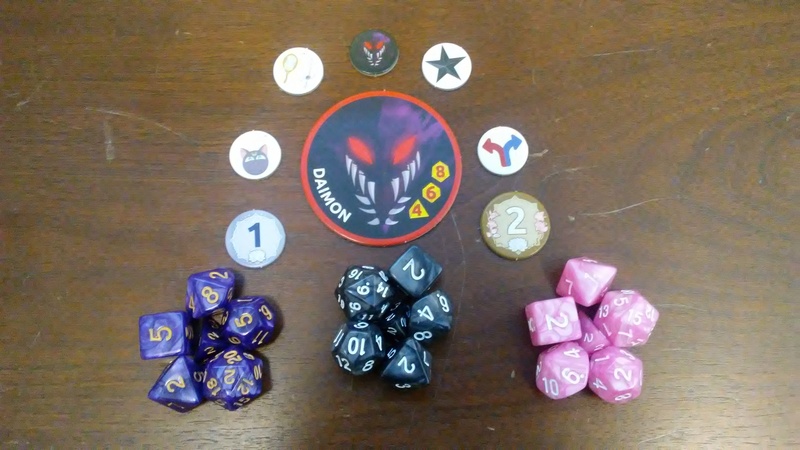 Any remaining combat dice are temporarily set aside and one of the large Daimon tokens is placed in front of them from the supply, along with it’s 3 combat dice. The player then rolls it’s combat dice as if it were a normal character under their control. As a matter of fact, this Daimon will now battle just like a normal character in place of their character. Once the Daimon is defeated, the player returns their character and the exact same dice and values as when the Daimon was summoned to the battle. However if the Daimon captures the opponent’s final die, the round is over. For more information on how scoring works with the Daimon, please check the rulebook. There are several other new special abilities, all of which are explained in more detail in the rulebook as well. Other than that, there’s not a whole lot of new material that this expansion introduces to the basic game. The game comes with plenty of great looking pieces. To begin with, there are 3 new sets of beautiful looking dice. The colors are bright and fun. There’s a pink, a purple and a dark gray set. I’m partial to the gray and purple dice. Each die has large numbers on it and the finish is marbleized. As I mentioned earlier, there are also 12 new character cards. These are the same size and quality as those of the core game. Each card has a large picture of the character along with all the pertinent information to be able to play them. The artwork on these is really cool and looks like it was taken right from the show. The game also comes with a punchboard full of various tokens. There are tokens for each of the new special abilities, a couple of coins and 2 large summoned Daimon tokens. These are rather creepy looking. Each token is made of thick cardboard and contains all the pertinent iconography. The Daimon tokens have a bit of a rules explanation on how they are used on the back of them, which I found to be quite useful. Finally the last pieces are the challenge cards and the lanyard. The challenge cards have a chibi style character on them with a cute word balloon for challenging other players at conventions with. These are really cute and kind of fun. The lanyard has all the new hero characters introduced in this game on it, once again in chibi style. The lanyard has a plastic card holder that you can place one of those challenge cards in, which I thought was pretty neat. 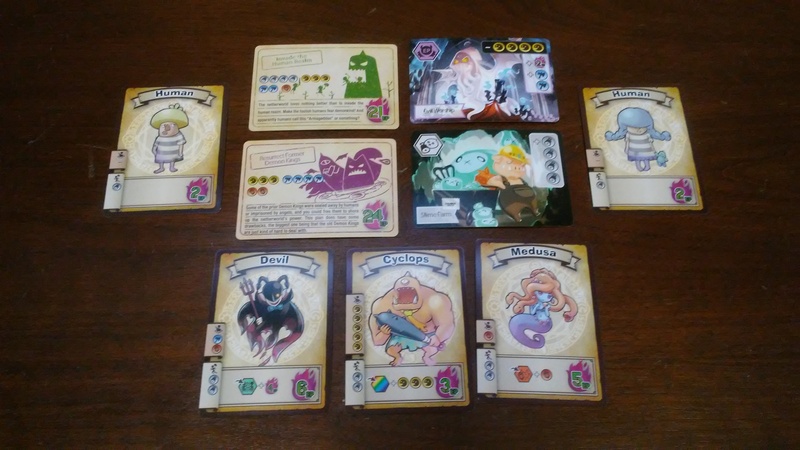 Needless to say, my daughter liked the look of each piece in this game quite a lot, except for those summoned Daimon tokens. Overall, I like how everything looks and feels. It fits in really well with the look and feel of the original game. Once complaint that I’d had with the base game was that there weren’t enough dice, thankfully this expansion rectifies that. Good job! The rulebook for this game isn’t all that long. It only consists of 4 pages. Three of those pages explain the new special abilities and how each one works. Of course the Summon Daimon ability takes up a whole page by itself. The back page of the book is an example of play with a picture of 2 of the character cards. That’s the only example and the only pictures in the whole 4 pages worth of rules. There is no mention of the original rules or anything of that nature. It’s assumed that the players of this expansion have a copy of the main game. As a matter of fact, the box even states that it requires the base game to play this. Personally, I’m a little put off by the rulebook for this one. Almost no pictures, only one example and no rules reference. While I realize that this is intended for use with the base game, I personally feel that it could be used by itself to play with 2 players. That may not have been the intended way to use this expansion, but I feel it could have increased the appeal of it overall by simply adding another page or two of rules. As it is, I’m a bit disappointed with the rulebook. Opportunity missed. Just like the base game, the expansion is all about rolling dice and battling each other. All of the normal and special rules and variants can be used with this expansion without any problems. As I mentioned earlier, this expansion comes with a host of new characters that players can choose from, each with a new ability. Granted, some characters share the same ability but the fact that each character uses different dice makes each one feel unique. The new abilities are really cool. However I do feel like the Summon Daimon ability is a bit overpowered. Being able to basically throw another character into the mix to keep your main character safe can be a bit daunting for your opponents. Still I do like the ability, even though it’s tough to play against. Other than that, there’s not a whole lot new that this introduces to the game. That’s not to say that there’s anything wrong with that, having new characters to play with new abilities is always fun. However I will say, it would have been nice to maybe add a few new variants, possibly even a solo one to play around with. That’s just my thoughts anyway. As it is, fans of the original Sailor Moon Crystal: Dice Challenge should really enjoy this expansion. I would dare say that fans of any of the Button Men games would enjoy it too, as the whole game’s concept is taken from them. This is one that I would recommend, especially if you already have the base game or enjoy dice rolling games. Sailor Moon Crystal: Dice Challenge – Season III is an expansion for Sailor Moon Crystal: Dice Challenge. The expansion doesn’t really add much in the way of extra play time. Most game sessions last around 10-15 minutes. The cards and dice are really great looking. The rulebook could have used some more pictures, examples and at least a brief summary of the rules. The expansion is pretty nice and adds plenty of new characters and some fun new Daimons to challenge the heroes with. It’s pretty fun and is a nice addition to the basic game. Fans of the original Sailor Moon Crystal: Dice Challenge should enjoy this one. I also think players that enjoy dice games would like this as well. Just be aware that you’d need the base game or at least some rules from the basic game to be able to play. This is one that I’d recommend, especially if you have the base game. For more information about this and other great games, please check out Dyskami Publishing Company at their site. 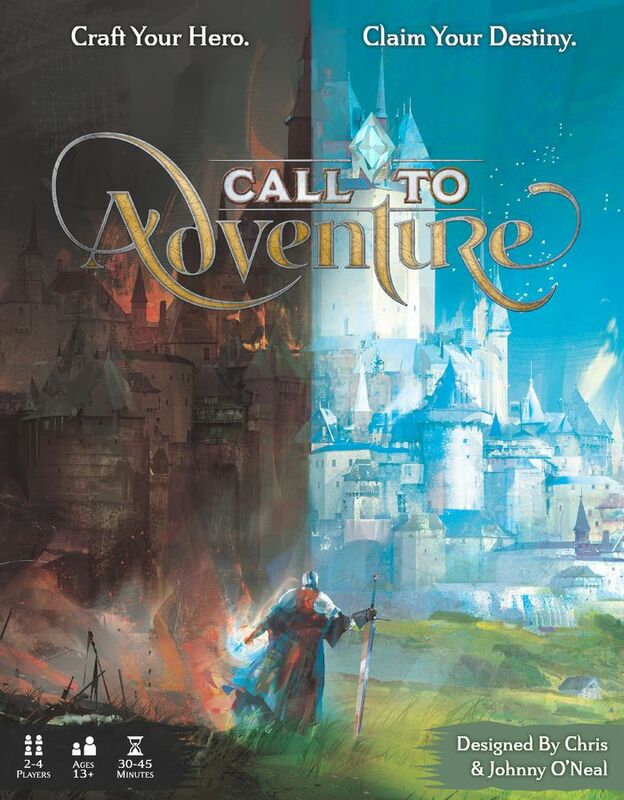 Call To Adventure is a game by Chris and Johnny O’Neal, published by Brotherwise Games. It is for 1-4 players. In this game, players will be creating an epic fantasy character in true story telling fashion. Players will need to overcome challenges, acquire traits and face off against their most dangerous adversaries to obtain Destiny points. In the end, the player that scores the most Destiny points will be declared the winner. To begin, all of the different card types should be separated by the card back. Each individual deck should then be shuffled thoroughly. Each player is then dealt 6 Character cards; 2 from the Origins deck, 2 from the Motivation deck and 2 from the Destinies deck. Players choose 1 of each to keep. The remaining cards are returned to the box. Each player is also dealt a Hero card and is given 3 Experience tokens. Players should keep their Hero card a secret from their opponents. Players are given a player board and a Hero marker. The player board is placed in front of the player and the Hero marker is placed on the third level from the top of the Corruption track. Players will now place their chosen cards on their player board. Their Origin card is placed face up on the left space. The Motivation card is placed in the middle face up and the Destiny card is placed on the right space face down. It should be noted that the player may look at their face down card at any time. The Story decks are set up in the middle of the play area as follows. In a column from top to bottom should be placed the Act III, Act II and Act I decks. Beside each deck a number of cards are laid out in a face down row. The number of cards is determined by the number of players. For introductory games, a few cards are removed from each deck. The specific cards removed and the number of cards for each row are explained in more detail in the rulebook. The Hero and Antihero decks are placed at the end of the Story deck rows. The Rune tray with all the Core Runes, Ability Runes and Dark Runes are placed within reach of all players. Once everyone is ready, the Act I cards are flipped face up. The first player is chosen and play now begins. The game is played over several turns through 3 Acts. Each turn a player may take a number of actions. These actions are Gain a Trait, Attempt a Challenge and Other Actions. First the player may Gain a Trait. To do this, the player must simply meet the requirements listed on the card. Once gained, the player will place the card under their current Storyline card. It should be noted that Act I cards are placed under the Origins card, Act II cards are placed under the Motivation card and Act III cards are placed under the Destiny card. When placed, the top of the Trait card should be visible. Another action that may be taken is to Attempt a Challenge. To do this, first the player must assess the difficulty of the Challenge by taking a look at the number on the side of the card. The player will then declare which path they choose to take, either the one on the top of the card or the one on the bottom. It should be noted, in some cases a +1 icon will be present, indicating that the difficulty is increased by 1. The player then takes the three core runes and adds 1 matching Ability rune for each relevant Ability icon that they have in their story. These runes are listed on the side of the card under it’s Challenge difficulty number. The player also has the option of adding Dark runes by spending 1 Experience token. This may be done up to 3 times per turn before attempting a challenge. The player then applies any card effects that may be in effect from playing Hero or Antihero cards. Once all that’s been done, the player will cast the runes. That means that they will throw the runes onto the table and see which sides land face up. Runes will give different results based on the rune type. Core runes can give the player a point toward the challenge or provide the player with a Hero or Antihero card. Dark runes can add 1 or 2 points toward the challenge, but can also corrupt the player. Too much Corruption can cause the player to be unable to play Hero cards or even spend Experience tokens to cast Dark runes. Ability runes can provide either 1 or 2 ability points towards a challenge. If the player reaches 3 of a specific ability type, then they gain the use of the Special rune that can allow the player to draw either a Hero or Antihero card or even gain an Experience token. If the result equals or exceeds the difficulty of the Challenge, the player succeeds and will then place the gained card under their current Character card with the top or bottom of the card showing, based on which path they chose. If the player fails the challenge, the cards is discarded from the game. A new card is then drawn from the corresponding Act deck and placed in the empty spot. The player then receives an Experience token. It should be noted, if a player has no valid options in the current Act wither to gain a Trait or attempt a Challenge, such as having cards with prerequisites that they do not meet, then the player may discard and replace 1 visible card without paying it’s Journey cost. The player also has other Actions that they may take in addition to Gaining a Trait or Facing a Challenge. They may Journey. To do this, the player may spend an Experience token to discard a card on the table and replace it with another one from the same deck. This may be done once per turn. If a challenge with an Ally under it is discarded, the Ally is discarded as well. The player may use another card’s effect, following the instructions on the card. They may also choose to play a Hero or Antihero card. These types of cards are gained when a certain icon is gained; light icons allow the player to draw a Hero card while dark icons allow them to draw Antihero cards. A player’s position on the Corruption track tell them which type of cards they’re able to play. Once these are played, the player places it face up beside their player board. Triumph and Tragedy values of these are added to a player’s score at the end of the game. All of these other Actions may be taken as many times as they’re able to. Once a player is out of actions to take, play passes to the next player in turn order. At this point, any effects from Hero cards, Antihero cards or any other cards are ended. New cards are drawn to replace any that were claimed from the rows during that turn. The game continues until a player has place 3 trait or challenge cards under their current Act. When this is completed, the player must then end that Act and may no longer gain traits or face challenges from that Act. On their next turn, they will reveal the next row of cards for the next Act, if they’re the first player to have completed the previous Act. They will now gain or face cards from this new Act. Once a player has gained 3 cards under their Destiny card, their game is over. The remaining players may take one final turn before the game ends. After the game has ended, each player will reveal their Destiny card. Players will then add up their Destiny points under their Character cards, adding any Triumph and Tragedy points together. Points are also gained from Story icons and unspent Experience tokens, as well as for each each Hero and Antihero card played. Players will also gain points for their position on the Corruption track, as well as for their Destiny card, based on it’s particular requirements. Players compare their score and the one with the highest Destiny score is the winner. Players may then tell their character’s story by fitting all the story cards together into a tale of epic proportions. This is a really gorgeous looking game. Every piece fits together to form a beautiful fantasy world. First there are the player boards. These are thick cardboard and look like any basic starting adventure style board. Nothing really remarkable about them but they do have a lot of references to help players with during the game. There are places on these to place your different cards and each space is marked with the backing of the beginning card type. The experience tokens are these thick red see through plastic pieces. They are diamond shaped and make me think of an rpg video game, how that you might be awarded with experience for fighting a monster and these little gems might pop up on screen. Another set of plastic pieces are the runes. These are quite thick and feel really good in your hands. I really enjoy throwing these things around. They are really great quality and it’s very easy to determine which rune is which, based on the symbols. Speaking of the symbols, these take a bit of time to learn what each one means. With a few plays under your belt, it becomes second nature. There are also some plastic hero markers that are used on the player boards to help players remember how dark or light their character is. Finally there are the cards, there are 2 sizes of cards in this game. There are the larger tarot sized cards that make up the character and story cards and then there are the hero and antihero cards that are regular sized playing cards. The artwork on each of these is simply amazing. I really love how cool they look. Each one of these really help draw me into the story for this character that I’m creating, their successes and their failures. As a matter of fact, it was the artwork of this game that drew me to it. The finish on the cards is somewhat like that on a Magic the Gathering card. It’s a bit glossy but not shiny. The only thing that would have made these better would have been some linen finishing on them. Needless to say, I love the look and feel of this game and find the theme fits perfectly with each piece. Coming from a background of years of playing and DMing D&D, the fantasy elements of this game are great. Any fantasy game lover should enjoy the components of this game. The rulebook for this game is great as well. There are lots of pictures and plenty of examples of gameplay throughout the book. The rules are laid out very well and each piece and part is explained thoroughly. Everything is easy to read and easy to find whatever you’re looking for. There’s a nice section that explains all the different runes and what each symbol means, along with pictures of each. The book also contains sections on how to expand the game using allies and adversaries. There’s also some variant rules for playing the game as a co-op or solo. These are really cool. I love a good solo game and was very happy to find these in the rulebook. The book even has a chart that explains rune probabilities. Basically it gives you a minimum, average and maximum that you should probably expect on throwing certain sets of runes. That was a rather neat addition that I found interesting. The last 2 pages of the book contain frequently asked questions to help clarify any rules questions that might come up during gameplay. Once again, really great addition. Finally on the back cover is a quick start guide that explains how to setup, and play the game. Overall, this is a great rulebook that is designed extremely well. It’s actually one of the most streamlined and easiest to understand set of rules that I’ve read. I’m very happy with the look of the book and the clear instructions on how to play the game. Excellent job! I’ve always enjoyed a good story. I guess that’s why I’ve enjoyed playing RPGs like D&D over the years. Of course the best part of any good story is a good character. My favorite part of playing D&D was creating new characters. I loved making up an elaborate back story for each one with all the twists and turns that I knew would be idea generators for the DM. This game takes that part of D&D that I loved so much and makes it into a game in itself. The idea of creating this fully realized character with the interaction of some truly gorgeous looking cards really appeals to the fantasy gamer in me. I would like to note that the mechanics of creating a fantasy style character is not new. In fact, Roll Player took that idea and created a really fun dice game with that same concept. By the way, I love that game. But what about this game and how it plays? I will admit, when I first saw the runes I didn’t think they’d work all that great. I had never seen a game use runes instead of dice to simulate luck before. I’m happy to say that I was wrong. The novelty of throwing the bones, so to speak, was actually quite fun. It kind of made me feel like a shaman or medicine man from one of those old adventure movies. Needless to say, I really enjoy the runes and I’d love to see more games use them as well. As for the story aspect of the game, I love how you’re gaining traits and attempting challenges to better your character, much like you would in a normal RPG game. The hero and antihero cards can help you refine which path you want to pursue. Speaking of antiheroes, I like that this game allows you to pursue a more evil route as well as going the tried and truth path to purity. For me this game is just full of imagination and fun. For us, we like to tell a short story about our character after we finish playing. You wouldn’t believe some of the amazing stories that I’ve heard. In any event, that’s just the multiplayer game. The game also has rules for a solo or co-op game that is a lot of fun too. As I mentioned earlier, I love creating characters. The idea of facing the adversary on an epic quest, while strengthening and empowering my character to be the best that he/she can be is pretty darn cool. I also like that I can team up with other players to face off against a common foe. It just adds another level of gameplay to me. I think fans of character building games like Roll Player or even fantasy RPG players should really enjoy this one. Solo gamers or those looking for a unique co-op game should also enjoy this one. This is a game that I highly recommend. I really enjoy everything about this game and am hoping to see some expansions for it very soon. Call to Adventure is a game about character building and story telling in a fantasy realm. It doesn’t take very long to play. Most game sessions last around 45 minutes to an hour. The components are fantastic. The artwork on the cards is truly gorgeous and it really draws me into this fantasy realm that my character lives in. Even without linen finish on the cards, each one is still fun to look at. The rulebook is well written and streamlined for ease of reading. I like that there are ways to increase the difficulty as well as to play the game solo and cooperatively included in the rules. The game itself is a lot of fun. Creating characters and facing epic challenges is what this one is all about. I love the stories that come from each player’s character and how you can let your imagination run wild with this one. Fans of character creation games like Roll Player and RPG games like D&D should enjoy this one a lot. Solo and co-op players should also find something to love with this one as well. This is a game that I highly recommend. The only thing left to do for this one, is add some expansions. Wink wink, nudge nudge, say no more! For more information about this and other great games, please check out Brotherwise Games at their site. 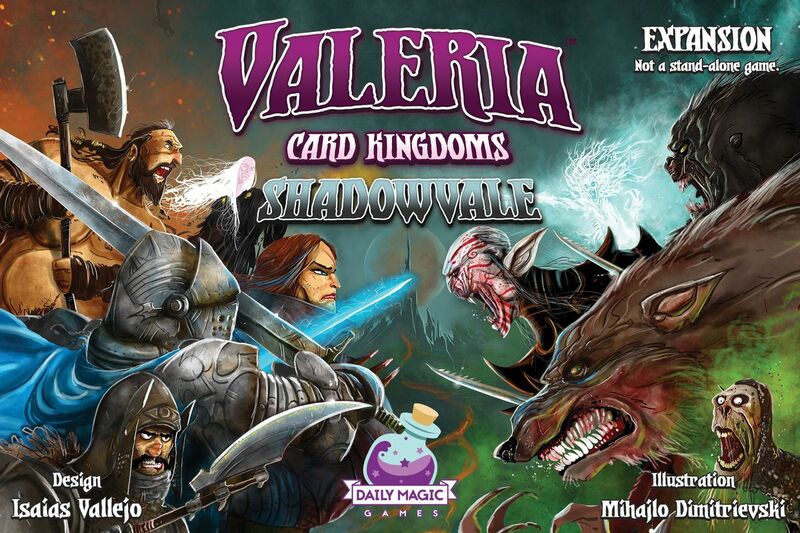 Valeria: Card Kingdoms – Shadowvale is an expansion for Valeria: Card Kingdoms by Isaias Vallejo, published by Daily Magic Games. It is for 1-5 players. This expansion adds a bunch of new cards for the game, including new Event cards. For more information on Valeria: Card Kingdoms and how to play the game, please check out the link below. In many ways, the setup for this expansion follows the basic setup rules from the main game, with just a few changes. When using the expansion, 1 Exhausted card per player and 1 facedown Event card per player are shuffled together. The shuffled cards are then placed in a stack above the Monster row. The remaining Exhaustion and Event cards are returned to the box. Players have the option of choosing a specific Event card that they’d like to play with as one of the Event cards used instead of random selection. When playing the game, there is another change to the basic rules. During the Action phase, after an Event card is revealed, the instructions on the card must be followed before moving on to the next action or phase. Actions taken due to an Event cards effects, do not count as an action for the player’s turn. If the Event affects multiple players, then the actions are taken in turn order beginning with the active player. As far as this expansion goes, there’s not a whole lot of new changes. As with the previous Flames & Frost expansion, there are Event cards as well as cards with the Wild and Banish Card icons. Wild icons count as any other resource, either strength, gold or magic, and can be used in place of one of them. Banish icons mean that a card of the player’s choice must be removed from the game. It should be noted however that a player may not banish a Starter card. On top of what’s already been mentioned, this expansion adds 5 new Monster Areas and a new Monster type. The new Monster Areas are the Sewer, Necropolis, Woods, Den and Crypt. These can be interchanged with the other stacks of the main game. The new Monster type is the Warden. These new monsters belong to the Monster Area shown on their card. When setting up the game, the Warden is placed above the Boss Monster in it’s Monster Area stack. As you can see, these new areas and monsters work well with the theme of this expansion. This expansion consists of a bunch of new cards, as well as some dividers for keeping them separated when placed inside the core box with all the others. Each card goes along quite well with the new theme. The shadowy creatures are really emphasized in this. There are zombies, banshees, werewolves and vampires, along with some other creepy and gruesome creatures. There are also new Domains that fit in with the theme as well. Many of these have a little tip of the hat to some very familiar monsters, authors or other well known figures; places like Karloff Castle, Stoker’s Pass, Shelley Commons and Vin’pryce Barrens. There are also a few new Dukes like Pas’cal the Gray Hunter and Gurira the Guardian, as well as new Event cards that capitalize on the dark theme. Finally there are all the new Citizen cards like the Exorcist, Hunter and Necromancer which also work well with the theme. As you can see, the theme is fairly heavy here. The artwork on each of the cards really pushes that point as well. I love how cool each design looks and the quality of the cards themselves. These really look amazing. Overall, the theme is great and works well with the game and the cards are top notch. I’m very happy with the look and feel of this expansion. The rulebook for this expansion isn’t all that big. It’s only a couple of pages without any pictures or examples of gameplay. One page covers the backstory behind the expansion and tells you how to set up and play the game with the expansion. The next page covers the new icons and card types. The back cover goes over several of the cards in detail, clarifying how each of them work. Other than that, there’s really nothing else to the rules. Like with previous expansions, there wasn’t a lot that changed so there wasn’t much need for anything more. Since a copy of the base game is required to play this, there was no need for any of the basic game rules. Needless to say, it gets the job done, quickly and efficiently. No flash or sizzle needed. If you’ve read my previous reviews of the base game or the Flames & Frost expansion, you already know my feelings toward the game. If not, then let me reiterate, I really like it a lot. This expansion adds a lot more cards to an already great game. On top of that, the theme is one that I really love. As an erstwhile DM for the Ravenloft RPG, I really enjoy the darker and shadowy monsters and places. As a fan of classic horror, like Dracula, the Wolfman and Frankenstein as well as being a huge fan of Vincent Price, this expansion really hits on every cylinder for me. I like how the new events, citizens and dukes play. I also enjoy fighting all the new monster types. Those players that already enjoy the base game will absolutely love this and should definitely add it to their collection, especially if they have a love for classic horror or the darker side of fantasy gaming. As mentioned in previous reviews, fans of Machi Koro will enjoy how the game plays so this expansion will also be a hit for them as well. This is one expansion that I highly recommend. For me, it’s a must own. It definitely reminds me of all those fun times playing Ravenloft, as the PCs stood against the hordes of darkness. Needless to say, this one will see a lot of replay at my house. 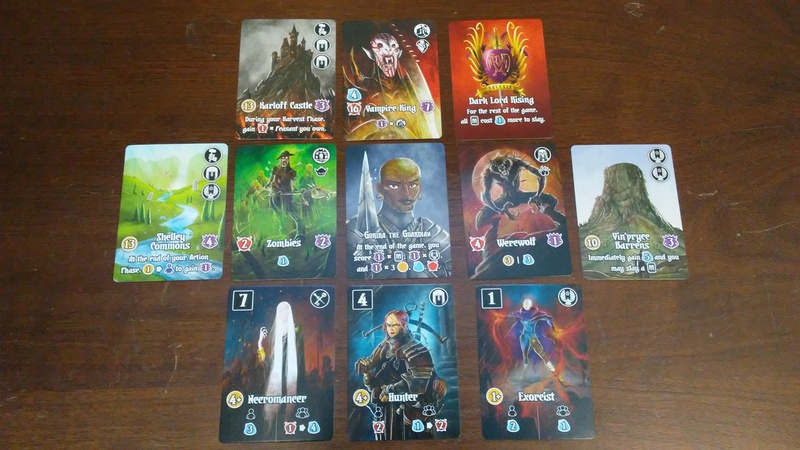 Valeria: Card Kingdoms – Shadowvale is an expansion for Valeria: Card Kingdoms that adds new cards with a darker and more sinister theme to the base game. This expansion doesn’t really add anything as far as play time goes. It can still be played in around 30 minutes or so. The cards look really great and fit quite well with the dark and shadowy theme. Fans of the Valeria Card Kingdoms and the previous expansion should find lots to love about this one. The new locations and monsters add some added flavor and fun to the game, especially for those of us that like the darker side of fantasy in our games. For players like me, this is a must own. Fans of games like Machi Koro will also enjoy the mechanics of the game and this expansion. This is one that I highly recommend. Don’t be left in the dark, get yourself a copy today. 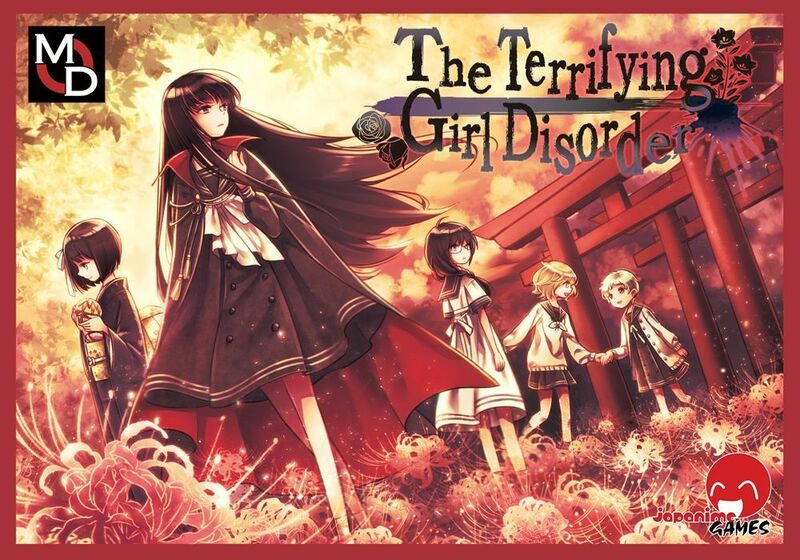 The Terrifying Girl Disorder is a game by Kuro, published by Japanime Games. It is for 3-4 players. In this game, players take on the role of a young school girl that has gained some amazing powers, only to have their memories wiped due to one of their own’s power. Suffering with amnesia, the players must try to remember who they are and what their objective is. In the end, each player’s true identity will be determined. The player that can claim the most victory points at this time, will be declared the winner. 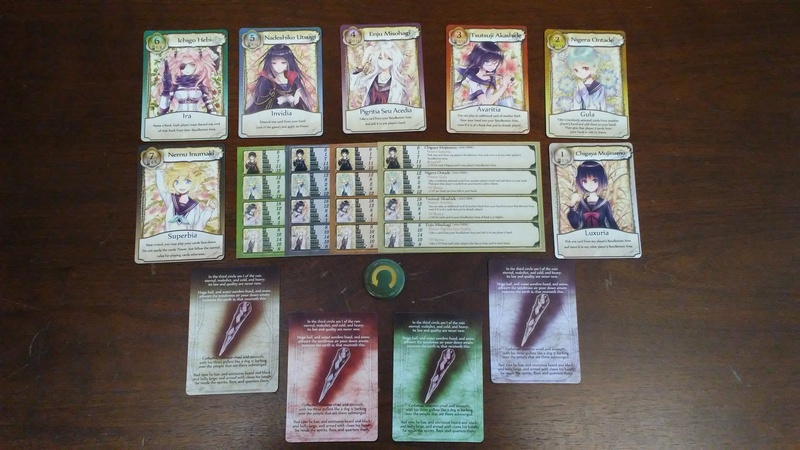 To begin, each player is given a Shard card, making note of which color they have. They will also receive the corresponding reference sheet in their player color. If playing with only 3 players, a number of Memory cards are removed from the deck as noted in the rulebook. When playing with 4 players, all the cards are used. The Memory cards are shuffled together to create a draw deck. Each player is now dealt 4 cards if playing with 4 and 5 cards if playing with 3. The first player is chosen and is given the Direction token. Play now begins. The game is played over 5 rounds. Each round is made up of 3 steps; Circle Setup, Counseling and Regaining Memories. The first step is the Circle Setup step. In this step, 3 cards are drawn from the draw deck for each player. The cards are laid face up in a circle in the middle of the play area, as shown in the rulebook. The second step is the Counseling step. In this step, each player will take a turn beginning with the first player and continuing in turn order. Each player’s turn consists of two actions; Shard Placement and Recollection. The first action is Shard Placement. For this action, the player will place their Shard card on one of the cards in the Circle that doesn’t have another player’s Shard on it. They’re also not allowed to place it adjacent to another player’s Shard. The player will then switch the location of 2 cards in the Circle that don’t have a Shard on them. The next action is Recollection. For this action, the player will take any number of cards from their hand, as long as they are the same rank, and place them face up in front of themself. The player will then perform the special power of that particular card rank, as noted on the card itself. It should be noted that the player is not allowed to play a rank of card that is already face up in their play area, however they must still play a card from their hand. If they don’t have any legal cards to play, the player simply shows their hand to their opponents and then chooses one card to play like normal, using it’s special power. Once the player finishes both steps, play moves to the next player in turn order. This continues until every player has taken their turn. The final step is the Regaining Memories step. In this step, the first player will choose a direction, either clockwise or counterclockwise. They will use the direction token to show the direction that they choose. Players will then gain the card that they put their Shard on, along with all the cards in the indicated direction between their Shard and another player’s Shard. These cards are then added to the player’s hand. If their hand goes over 8 cards, they must discard anything extra. At this point, the round ends. Players check their play areas and see who played the most cards during the Counseling step. That player is the first player for the next round and is given the Direction token. One thing should be noted, only cards that were played from a player’s hand will count towards them having played the most. For this reason, cards that are added due to a special power should be turned sideways when placed in the player’s play area. Once the first player is chosen for the new round, a new round begins. The game continues until the end of the fifth round. When this happens, the game ends and final scoring begins. Before scoring, a player’s True Identity must be confirmed. At this time, any face down cards are turned over and all the cards in a player’s play area are sorted, placing all cards of the same rank together. The player with the most cards of that specific rank is that particular character. That’s their True Identity. If there is a tie, the player with the most cards of that rank in their hand wins the tie. If a player is several characters, the character that that player has the most cards of in their play area is their True Identity. If a player has no identity, that player is Higan. More than one player can be Higan. Once each player’s True Identity is discovered, they will calculate Victory Points. Victory Points are determined from the number of cards in their play area of their True Identity, as explained on the reference sheet. They also gain an additional point for each card in their hand of the same rank, as well as gaining points for the character’s VP Bonus, also listed on the reference sheet. Higan players gain 3 VP for each card in their hand that is not another player’s True Identity. Players add up their points and the one with the most Victory Points is the winner. Inside the small box that contains this game, you’ll find a stack of cards, some reference sheets and a direction token. The cards are quite nice. In the main deck there are 7 different girl cards or ranks. Each one has a distinct look, number and power. Each card of the same rank is identical. This is pretty much what you’ll be dealing with the whole game. The artwork on each card has an anime/manga style feel to it. Each girl looks like something you’d find in one of those movies or comics. I like the look of these, although I would have like a little bit of change. I get that you may want all the same ranked cards to have the same image for ease of playing the game, but looking at the same pictures all the time gets old quickly. The shard cards are a picture of a shard on a colored background with a bit of text surrounding it. Each of these is a different color so that players can easily determine which card is theirs. The same colors are present on the 4 reference sheets. This helps the players remember their color. It also has some scoring information for each rank’s cards. This helps you figure out which card(s) you might want to try and collect. The final piece is the double sided direction token. This is a simple thick cardboard piece with a circular arrow going in alternate directions on either side. This is a great reminder for which way to pick up cards during the Regaining Memories step. Overall I like the look of the cards, but I feel like something’s missing. I’m not really sure what that might be though, as everything works well together. In any event, I think if you like this style of art, you’ll probably like the look of this game too. The rulebook for this game is really quick and simple to read through. There are plenty of pictures and examples throughout the book. Each component is described in great detail and each step of gameplay is explained quite well. There are several pages at the end of the book that describes each of the girls, their ranks and their powers. 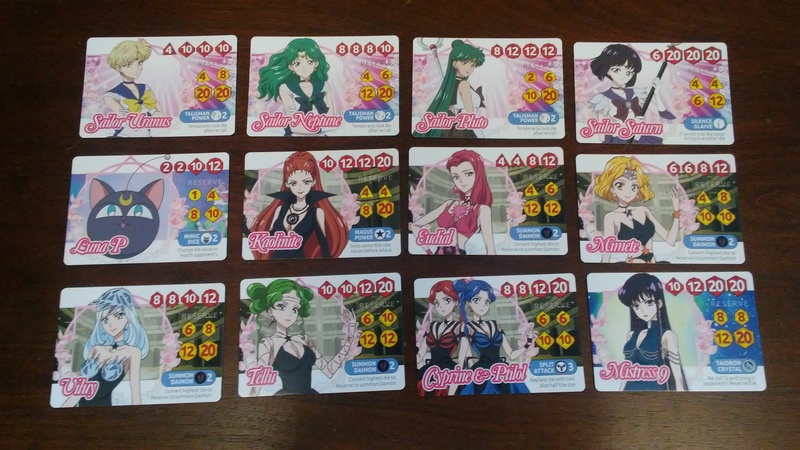 It also includes a detailed scoring chart that shows how each girl’s cards will score. I think the book is well written and easy to follow along with. I like how it looks and find the character references very helpful for scoring. Overall the book does a great job explaining everything and making it easy to get right into playing. This is one of the most unusual card games that I’ve ever played. It’s fast and easy to learn. The only hard part about the game is figuring out the scoring part. It’s a little bit wonky. Basically the game is just placing your shard, picking up cards and then placing a card or a set of cards in front of you in an attempt to get the majority in the right set of cards so that you can earn the most points at the end of the game. There’s not much mor to it that that. Of course the more cards that you’re able to pick up, the more chances are that you’ll get enough of the right cards to be able to play in front of yourself. Then there are the card abilities, these can make it where you have no cards in front of you. That may look bad at first but if the other players are focusing on just a couple of girl’s cards and you stock your hand with a bunch of the others, you can rack up a ton of points from being Higan. There is some strategy to this one, although I found more often than not, the game could end up very random. The cards you planned out and worked to place end up not scoring as many points for you as that player that I just mentioned, the Higan player. It’s for this reason that I wasn’t as thrilled with it as I thought I’d be. That’s not to say that the game is bad. As a filler card game, this is quite fun and unlike any other card game. It’s just a little more random and sometimes luck based. I did find it fun to be that guy that ends up having everything taken from them and then pulling off a victory anyway. This is a game that I feel fans of filler card games or that are looking for something a little out of the norm, may enjoy. Overall I liked it, I just don’t know how often it’ll make it’s way to the table. This is one that I’d recommend giving a try. It might be just what the doctor ordered. The Terrifying Girl Disorder is a light weight filler style card game about collecting memories to find your true identity. This one doesn’t take very long. Most game sessions last around 30 minutes or so. The cards are rather nice but feel a bit too similar. I’d have liked a few more images to break up the monotony. The rulebook is well written and is a great reference for the game. The game itself is a little unusual, especially in the scoring aspect. It has some strategy to it, but that can be negated through some luck based elements. This is one that is fun to play but feels a bit too random. Fans of filler card games or those looking for something a little bit different than normal may find a lot of enjoyment from this one. This is one that I’d recommend trying. Now, if it would just help me remember where I put my keys. 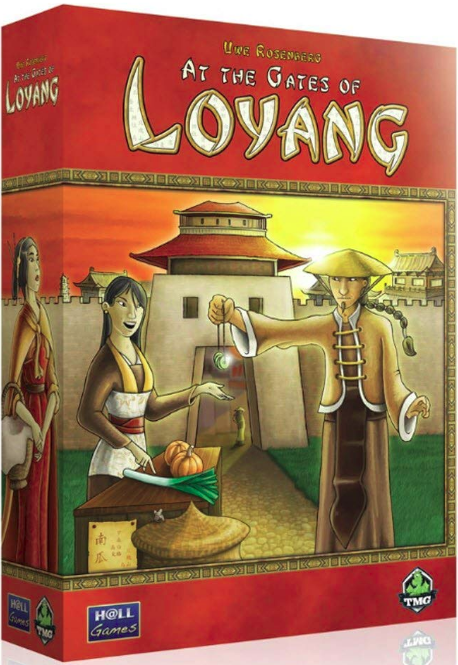 At The Gates Of Loyang is a game by Uwe Rosenberg, published by Tasty Minstrel Games. It is for 1-4 players. In this game, players take on the role of farmer during the Han Dynasty. They will be selling and trading their vegetables at the gates of the capital, Loyang. They will also be planting fields in order to gain more crops with which to sell even more vegetables. Players will also use helpers to assist them in lots of varied ways. In the end, the player that moves the furthest along the Path of Prosperity will be declared the winner. To begin, the Supply is created by separating the money, vegetables, Satisfaction markers and Loan cards into piles. The Action cards are shuffled together and placed face down in a pile in the middle of the play area. Each player takes 1 of the T-shaped boards and places it in front of them as shown in the rulebook. They also receive 10 cash, a Home field, a Scoring token, a Storehouse/Cart card, and a Turn Summary card. The Home field is placed at the top right of their board. The Scoring token is placed on the 1 space of the Path of Prosperity on their board. The Storehouse/Cart card is placed to the right of their board with the 1 side facing up. The money and Turn Summary card are placed to the left of their board. Players are also given 3 wheat, 2 pumpkins, 2 turnips, 2 cabbages, 1 bean and 1 leak. These are placed on the corresponding spaces of the player’s board. The 2 light colored spaces are left empty. Players also take 8 Private Field cards that consist of 2 sets of cards, each with 4 cards of 3, 4, 5 and 6 spaces. Each set is shuffled separately and then placed on top of each other to form the player’s Field pile. This is placed to the left of the player’s Home Field card. The Starting player is chosen and is given the larger Starting player token. The smaller Starting player token is placed in the middle of the play area for the time being. Players will now buy their 1st vegetable from their own player board, known as their shop, beginning with the first player and continuing in turn order. The cost for each vegetable is noted in the dark boxes of the player board beside each vegetable. Once the vegetable has been paid for, it is planted in their Home field. What this means is that it is placed on a Field card and all the other spaces of that field are then filled in within the same vegetable from the Supply. It should be noted that only the vegetables shown on the Home field card may be bought and planted and no more than 2 players may plant the same type of vegetable at this time. Once all this has been completed, play now begins. The game is played over 9 rounds. Each round consists of 3 phases; the Harvest phase, the Card phase and the Action phase. The first phase is the Harvest phase. In this phase, each player will turn over the top field from their Field pile and place it next to their other fields. They will then harvest 1 vegetable from each of their fields. The harvested vegetables are placed on the the Cart of the Storehouse/Cart card. If there are any vegetables that had been left in the Storehouse, these are moved to the Cart as well. If a Private Field has the last vegetable on it removed, then the card is removed from the game. Common fields from the Action card deck are placed on the Action card discard pile when their last vegetable has been harvested. The next phase of the game is the Card phase. In the beginning of this phase, a new draw pile is created by shuffling the discard pile into the remaining Action cards draw pile. Once this new pile has been created, each player is dealt 4 cards. Next, the Distribution round takes place. In the Distribution round, each player will have to play 1 card from their hand and 1 card from the “Courtyard”. The first player will begin this round by placing a card from their hand face up into the center of the table. This area becomes the “Courtyard”. Players will then, in turn order, take a turn that consists of one of the following options. They may place 1 card from their hand into the Courtyard, or they may take 1 card from the Courtyard and 1 card from their hand, playing both of them face up in the corresponding spaces of their own play area. Any cards remaining in the player’s hand are then placed into the Courtyard. This player is then unable to participate during the rest of this Distribution round. This continues until there is only 1 player that has not chosen 2 cards. When this happens, that player is no longer allowed to place any cards into the Courtyard, instead they must immediately choose from the available cards. It should be noted that if a player has only 1 card remaining in their hand, they must play it and choose 1 card from the Courtyard. They may never place their last card into the Courtyard. A couple of things should also be noted about the Action cards. When a Regular Customer is placed, a Satisfaction marker is immediately placed on the card with the blue side up. When a Market stall is placed, it is immediately filled with the vegetables shown on the card. When a Field Action card is placed, the player must immediately pay 2 cash for it. If the player does not have enough money, they are able to sell vegetables, use helpers or take out a loan to be able to pay for it. Once the last player has chosen and placed their cards, the Distribution round ends. The remaining cards in the Courtyard will then become the new face up discard pile. The last player to place their 2 Action cards now receives the large Starting player token, becoming the Starting player. The next to last player to place their cards takes the smaller Starting player token and becomes the 2nd player. This brings us to the third phase, the Action phase. On a player’s turn, they may take any number of actions and in any order during their turn. Each action may be taken as many times as the player wishes. However, Buying a Two-Pack may only be taken once during their turn. The player has 8 different actions that they may choose from. Each action is also listed on the player’s Turn Summary card. The first action they may take is to Sow Vegetables as Seed. To do this, the player will take 1 Vegetable from their Cart and place it on an empty field. The remaining spaces on the card are then filled with the same vegetables from the supply. At the top of each field card there’s a reference of what vegetables may be planted on that field. Another action the player can take is to Buy Vegetables in the Shop. To do this, the player simply takes one of the vegetables from their shop, paying the cost on the dark price tag, and places it on their Cart. The player can also choose to Sell Vegetables to the Shop. To do this, the player takes a vegetable from their Cart and places it in the corresponding empty space in their shop. They will then collect the price in the lighter price tag. It should be noted that if there is no empty spaces for the corresponding vegetable, it may not be sold at this time. Yet another action that may be taken is to Trade Vegetables at a Market stall. To do this, the player places either 1 or 2 vegetables of their choice from their Cart onto the bowl in front of the vegetable that they would like to trade for, collecting it and placing it on their Cart. It should be noted that the number of bowls in front of the vegetable are the number of vegetables that must be traded for that particular one. Once a Market card is empty, it is placed in the discard pile. The player can also Play or discard a Helper. To do this, the player simply plays the card and takes then resolves the card’s text. Most Helpers are played during the Action phase, but some may be played in other phases. This is noted in the text of these particular cards. Once the Helper has been used, it is placed in the discard pile. Likewise if a player simply wishes to get rid of the Helper card without using it, they can simply discard it to the discard pile. One thing of note, some Helpers have 2 actions that a player must choose from. The player is only allowed to use 1 of these options for that particular Helper. The player can Deliver to a Regular Customer. 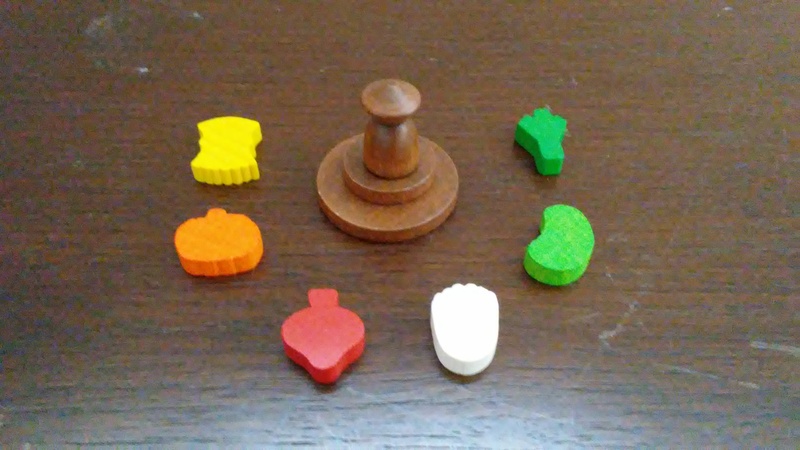 To do this, the player will place the corresponding vegetables on the card starting at the bottom and working up each round. Once a Regular Customer has been started, each round the player must deliver the same vegetables for another 3 rounds. If the player can not or does not wish to, the Satisfaction marker on the card is flipped over to the red side. If the player can not or does not wish to deliver to this Regular Customer while the red side of the Satisfaction marker is up, they must pay a penalty of 2 cash to the Supply. Once the player makes a delivery, they will receive the payment for that delivery as noted on the card. Once the fourth line on the card has been filled, it is emptied and discarded. Another action that may be taken is to Deliver to a Casual Customer. To do this, the player need only take the corresponding 3 vegetables listed on the card and return them to the Supply. The player will then receive the price listed on the card. If the player has the same number of Regular and Casual customers, then the payment is the price shown. If they have more Casual customers than Regular ones, then the payment is reduced by 2 cash. If they have less Casual customers than Regular ones, then the payment is increased by 2 cash. Once the delivery has been made, the card is discarded. The final action that may be taken is to Buy a Two-Pack. This is the only action that may only be taken once during the Action phase. To take this action, the player will pay the cost and draw 2 Action cards from the draw pile. The cost is equal to the number of either Helpers or Market stalls in their play area, whichever is greater. Any cards covered by another Action card, do not count towards the cost. Once the player draws their 2 cards, they must place them face up in front of themself. They will then choose to keep one or both of these 2 cards, or simply discard both of them. Any cards not kept are discarded. If the player choose to keep both cards, then they must place one of the cards on top of the other one. The choice of which card goes on top is up to the player. The top card is placed so that the card below is visible. It should be noted that if a field card is chosen either as the top or bottom card, then the 2 cash must immediately be paid. As the game goes on, whenever the top card is discarded, the bottom card is immediately moved to it’s appropriate place. Any additional actions such as stocking vegetables onto the card or placing Satisfaction markers are done at this time as well. At the end of a player’s turn, they will then move any leftover vegetables from their Cart to their Storehouse. Any vegetables not able to be stored in the Storehouse, must either be sold to their Shop or discarded. At the beginning of the game, each player’s Storehouse will only hold 1 vegetable. However they may upgrade their Storehouse by paying 2 cash. The card is then flipped over allowing the player to store up to 4 vegetables. Finally the player moves their Scoring Marker. Each step on the Path of Prosperity costs cash. The first step each round costs 1 cash. Each additional space that the player wishes to move costs the same amount as the number of the space which they wish to move to. For instance, moving to space 4 from space 3 would cost 4 cash. Once a player takes all the actions that they wish to take, play passes to the next player. Once all players have finished with their turn, the round ends and a new round starts following the previously explained phases. The game continues until the end of the 9th round. Once players have finished this final round, the game ends. Players that have taken a loan must then move their Scoring marker back 1 space on the Path of Prosperity for each loan they have. Loans may be taken at any time during the game and they provide 5 cash. However as just mentioned, they cost 1 space on the Path of Prosperity. Loans are never able to be repaid. Once all players have moved their Scoring markers based on loans, they will then check to see who is farthest along on the Path of Prosperity. The player that has moved the farthest is the winner. This is an amazing looking game that contains a whole bunch of great looking pieces. There are cardboard boards and tokens, wooden pieces and various types of cards. First there are the cardboard pieces which consist of the T-shaped game boards, Satisfaction markers and cash coins of 1 and 5 value. The boards are brightly colored and have special spaces for each of the different types of vegetables, as well as the ascending Path of Prosperity. I like how that each vegetable’s space matches the shape and color of the wooden vegetable meeple. The Satisfaction markers are blue on one side and red on the other, both with a Chinese symbol. The coins come in a smaller silver for 1 cash and a larger copper for 5 cash. Each of these has some Chinese symbols on them as well. They also have a hole in the middle, which were used to hold them on a string in the days that the game was set in. The only thing that would make these better is if they’d been made of metal instead of cardboard. The game also contains a whole bunch of wooden pieces. There are vegetable meeples, Scoring markers and Starting player tokens. The vegetable meeples are all brightly colored. Each one is shaped like the vegetable it represents. There are leeks, beans, cabbages, turnips, pumpkins and wheat. These are great! I love wooden tokens like these. They’re fun to handle and play with. The Scoring markers are hard to describe. I guess the best way is to say they’re like a pawn with a Chinese hat on. They’re stained a dark brown, just as the Starting player tokens are. Speaking of which, there are 2 Starting player tokens, a larger one and a smaller one. Both are round wooden discs. Just like the vegetables, I really like these wooden pieces too. Finally there are the many types of cards. There are Storehouse/Cart cards for each player. These are double sided and where players store their vegetables meeples. There are loan cards which look rather like a scroll and explain how these work. There are private fields and lots of different Action cards. The Action cards consist of common fields, market stalls, regular customers, casual customers and helpers. Each of these cards are brightly colored. The artwork on each of these is a bit cartoon-like. The characters have a similar style and feel as the artwork on the front of the box. Honestly, I rather like the designs used here. They could have chose to use more realistic designs but the cartoon like art on these cards is very fun. It gives you a nice sense of amusement and light heartedness instead of being so serious. I like that this was the path chosen for these. The game also comes with some turn summary cards which are a great reference for the players to look back at and remind them of their options in the Action phase. Thematically the game gives a great feel of just exactly what it was going for, being a farmer in China over 2000 years ago. I really love the look and feel of this game. The artwork is amazingly light and fun. It’s a beauty. The rulebook for this game is also a beauty. It’s got lots of great pictures and examples throughout the book. The design and layout reminds me of the rulebook for Agricola. That’s probably because both are from the same designer. Everything is laid out really well and is easy to read and understand. There are special boxes inserted throughout the book that give a few changes for playing your first game, for different player counts and special details about the rules. These are nice additions that you don’t have to pay much attention to unless you have specific need for those rules. The rulebook also includes rules for playing the game solo, which is always a welcome addition to any game in my opinion. There’s also an appendix of the cards, as well as 2 pages of details about the different Helper cards included in the game. These help players to understand these certain cards a bit better, giving a more detail explanation of each. The book also has a few little notes about the back history of the game which is a nice addition that adds a bit of flavor. I can say that this is an excellent rulebook. It’s well designed, just as I expected it to be. I couldn’t find anything that needed changing or improving. It’s very thorough and the rules are easy to follow in a step by step manner. Overall I think the book is well done. I have to say that this game has been on my want to play list for quite some time. It looked like a lot of fun with lots of bright colored pieces and plenty of challenges for players of all kind. Needless to say, I wasn’t let down at all. This is a very fun game. As the third game in designer Uwe Rosenberg’s Harvest trilogy, this game is an absolute classic. The reason being is that it’s just so much fun to play. I’ve enjoyed several of Mr. Rosenberg’s games, especially Reykholt, Patchwork and Agricola. This is another one to add to that list. The game provides lots of different choices and actions to take but you never have the ability to do everything that you really want to do. There’s always something that you wish you had just one more vegetable or one more coin for. Playing with other players, the game is full of tension and a mild bit of interaction, mostly that comes from the Card phase of the game. The Action phase is more like playing solitaire. Of course you’ll be watching to see what other players do on their turn so that you can try to pull ahead on the Path. One thing that I wanted to point out is that many times players are afraid to take a loan so as not to lose that space on the Path. Just because you take a loan, does not mean that you can’t win. In some cases, you pretty much have to if you want to get done what you’re trying to do on your turn. The main thing is not to be afraid of loans. As for the solo game that I mentioned earlier, it’s a definite challenge. You’re trying to reach level 17 on the path. But to be a true Master, you need to reach level 19. This can be rather difficult. For this version, the Card phase is a bit different, having the player buy cards from a grid of 4 rows and 3 columns. Cards can range from free to 2 coins each. Even more so than in the multiplayer game, cash is king. Trust me, it takes a lot to get that far. As tough as it can be at times, I’m always up for the challenge that this game provides. Needless to say, I enjoy the solo game just as much, if not possibly more, than the multiplayer game. Both have their own feel and charm that I like. Solo gamers will find plenty to love with this one. This is a game that I think a lot of players will enjoy regardless of their player count. Fans of any of Mr. Rosenberg’s games like Agricola or Reykholt should absolutely love this one. I definitely do. It’s one of my top 10 most favorite games. Once you’ve played it I’m sure you’ll agree. This is a game that I highly recommend. 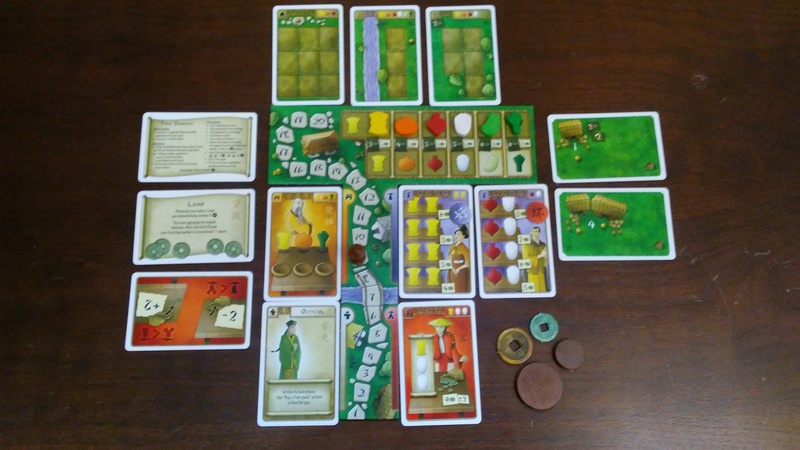 At The Gates Of Loyang is a game of farming and selling crops in Ancient China. It’s not super long. Most game sessions last from an hour to an hour and a half, depending on the number of players. The components are amazing. The wooden vegetables are fun to play with and the artwork throughout the game is light and fun as well. I still want an upgrade to metal coins for this one though. The rulebook is well written and designed. It’s easy to read through and very thorough. I especially love the added solo variant in the rules. The game itself is a lot of fun for groups of players and for playing solo. The multiplayer game has a great competitive feel to it as players race to get the farthest on the Path of Prosperity. The solo game has more of a puzzle feel as you work to align everything just so. Both are challenging but enjoyable. Fans of games like Agricola or Reykholt will enjoy the similar theme and challenge of this game. This is one that I think a lot of players will like. This is a classic board game that I highly recommend. If you don’t already own a copy, you definitely want to pick one up while it’s available again in reprint. It’s well worth it. 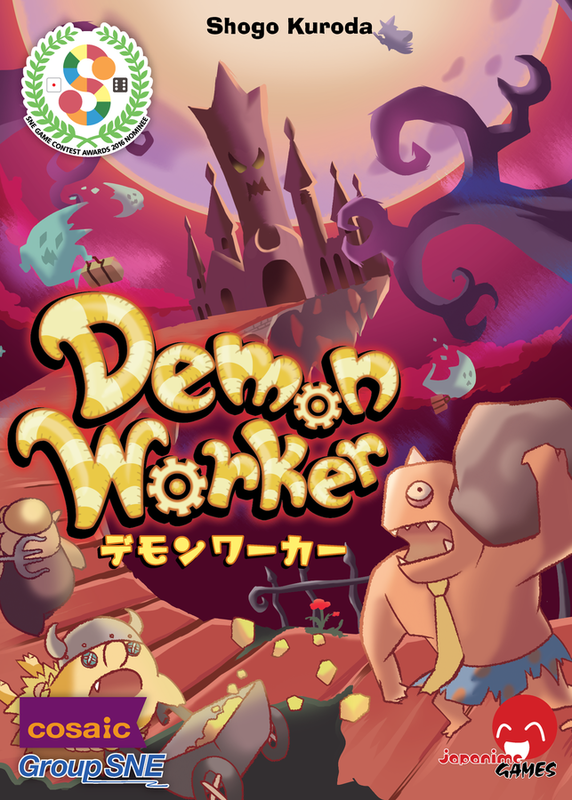 Demon Worker is a game by Shogo Kuroda, published by Japanime Games. It is for 3-4 players. In this game, players take on the role of one of the most powerful denizens of the Underworld as they attempt to claim the empty Demon King’s throne. To do this they’ll need to interview and hire the most competent demons, pay them a fair salary and put them to work enacting your most evil and nefarious plans. Of course their opponents will also be trying to make a bid for the throne as well. The player that can best unleash their inner demon and prove they have what it takes to rule the underworld will be declared the winner. To begin, the Work Area cards are placed in the middle of the table in a specific pattern as shown in the rulebook. The EP board is placed beside the cards. If there are only 3 players, the Cemetery and Trash Dump cards are returned to the box. The Planning cards are shuffled together and placed face down below the board, leaving room for a discard pile. The Sacrifice, Weapon, Magical Stone and Food tokens are placed beside the board in separate piles. Players choose a color and take the corresponding player pieces. They are also given a Summary card and 2 Human Worker cards. The Human Worker cards are placed face up in front of them. The player will place one of their player pieces on each card. They will also place one of their player pieces on the 0 space of the scoring track of the EP board. The Round Marker is placed on the 1 space of the Round Track. The Demon Worker cards are shuffled together and each player is dealt 6 cards each face down. Players are also dealt 2 Planning Cards, which they must not look at just yet. The first player is chosen and is given the “1” Turn Order token. The remaining players take consecutive turn order tokens in clockwise order from the first player. Each player is given 3 Sacrifice tokens, 2 Weapon tokens and a Magical Stone token. Play now begins. Before the game can actually start, players must interview Demons by having a Demon Worker draft and making their plans. To perform the Demon Worker draft the players will look at their Demon Worker cards and choose one of them to keep. They will then exclaim, “You’re Hired!” and place the chosen card face down in front of themself. They will then pass the remaining cards in their hand to the player on their left. This process is repeated and continues until each player has selected 6 workers. Once this happens, players will pick up their 6 Demon Worker cards and place them in their hand. Next the players will need to make their plans. This is done by look at their 2 Planning cards and choosing one of them to keep. The other card is placed face up in the Planning cards discard pile. It should be noted for players playing their first game, the Interview process should be skipped and each player should simply use the 6 Demon Workers that they were originally dealt. Once all this is completed, the game can actually begin. The game is played over 5 rounds. Each round is divided into 3 phases. Each phase is played in order. Those phases are the Supply phase, the Assignment phase and the Cleanup phase. The first phase is the Supply phase. In this phase, each player will receive the resources and EP shown on their Turn Order token. Players keep track of their EP by moving their playing piece upward on the scoring track of the EP board. The next phase is the Assignment phase. In this phase players will take turns assigning their workers to the work areas, beginning with the player that has the lowest numbered Turn Order token. To be able to use a worker, the player must pay their salary. This comes in the form of their Dispatch cost and any additional costs. The amount and type of resources that must be paid for the Dispatch cost are shown on the left side of the Worker card. The player must then pay any additional costs that may be required. These additional costs come in the form of Food tokens. The rule is that if there are multiple workers on the same work area, then the player must pay 2 Food tokens for each worker already assigned to that work area. It should be noted however that there are a few exceptions to the rule. The Trash Dump and the Audience Chamber never require any additional Food token costs be paid. Both allow any number of workers to be present at any time. Once the player has chosen a worker, they will then place their worker and proclaim, “Go,” along with the worker’s name. This makes it possible for the other players to see which worker is being used more easily. The worker’s salary is then paid and the player piece from that worker is placed on the chosen work area card. At this point, the worker’s special ability takes effect. Once it’s resolved, the effects of the work area are resolved, starting from the top. Both the worker’s special ability and the work area’s effects must be used, only the War Room’s effect is optional. Once a player has assigned their worker, the next player in turn order will take their turn. One last thing, players have the option of passing if they aren’t not able to pay their worker’s salary or if they just don’t want to place a worker. If a player passes, they are done with the Assignment phase and may not place another worker later. Once all players have passed, the Assignment phase ends. This brings us to the final phase, the Cleanup phase. In this phase, players prepare for the next round. This is done by following a few steps. First, each player will collect their playing pieces from the Work Area cards. Next they will place one of their playing pieces on each of their workers in play. Players will then pass their Turn Order Tokens to the player on their left. Finally, the Round token is move 1 space on the Round Track. A new round will then begin starting with the Supply phase again. The game continues until the end of the 5th round. At the end of the Cleanup phase of the fifth round, players will not move the Round token, instead they will count their points. Players gain points for summoning 5 or 6 of their Demon Workers, for completing Planning cards and for paying the dispatch cost for each worker they have in play one last time. Players move their playing piece on the EP board fore each point they gain in these ways. The player with the most EP is the winner. This is game with some nice looking pieces. First off there are a whole bunch of thick cardboard tokens. There are Sacrifice tokens, Weapon tokens, Magical Stone tokens and Food tokens. These are the resources that players will need to pay the salaries of their workers. Each of these are brightly colored and bear a small image of the resource they represent. There are also x5 tokens, 50EP tokens, Turn Order tokens and a Round token. The x5 tokens are gray and have a space to place a resource token on it. This counts as having 5 of that particular resource. 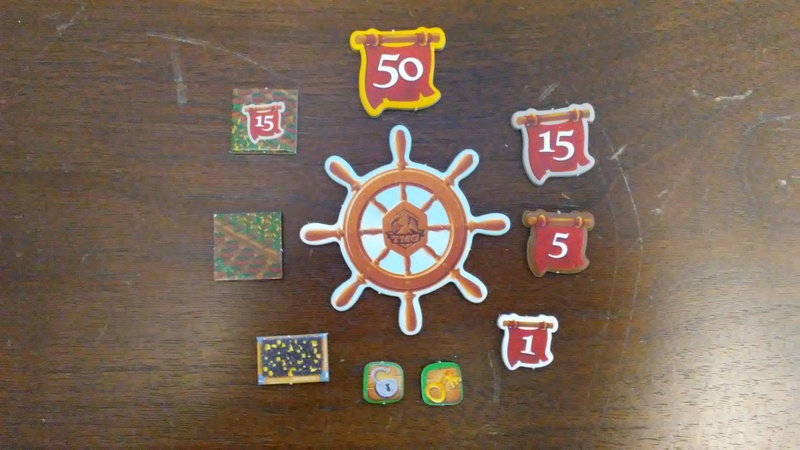 The 50EP tokens are used for players that go over 50 points on the EP board. These have a purple fire with green numbers on them. The Turn Order tokens are large rectangular tokens with large colored arrows on them and a list of resources on them. These tell players who goes first and who goes next. The Round token is a bright green token with a little red demon holding a round sign. All of these tokens are good and sturdy. They look nice and work well with the game’s other designs. The board is a single fold black and white board with very little in the way of artwork or designs. This is one of the aspects of this game that I feel fell a bit short. It could have been more colorful or artistic. Instead it’s just bland and colorless. I really don’t like it. Something else I don’t like are the Summary sheets. These are really thin sheets of glossy paper with an image of that color’s demon lord. It also has a reference for the iconography in the game, along with explanations of the different work areas and worker’s abilities. I do like the references and explanations. That’s one really good part about the sheets. What I don’t like is the thin quality of them or the satanic references. Not to be a prude, but why was there a need to have anything other than a color for these? Why was there any reason to have Satan and Beelzebub, along with the other demons, on these? What purpose does it really serve? As for the quality, why not have made a simple card with references or something thicker and sturdier. I simply feel that these will be torn fairly easily, which might be a good thing as the “thematic element” of them aren’t worth keeping. Thankfully the cards are actually kind of cute and fun. I know, cute demons right? In any event, the cards are great quality and look well thought out. These take a bit of getting used to, due to the iconography, but it’s nothing to worry about. The final pieces are the bright wooden cylinders that are the player pieces. These look nice and are easily distinguishable between colors. For the most part, I think the game looks good. It’s just those few pieces, the board and summary sheets, that leave a bad taste in my mouth. Overall, it’s pretty decent. The rulebook for this game is a bit unusual. It is a long rectangle with 3 folds that expand it out to 4 pages across. There’s a little bit of artwork across the book but it’s rather small making it difficult to see. There are 2 or 3 examples that help players understand the rules a bit better. The book has sections that explain the different work areas, workers and planning cards. This is a great reference and easy to use. It really helps you to understand the iconography of the game. I prefer using this to the actual summary sheets. It’s easy to pass around and doesn’t have the references on it. While the design of the book is a bit weird, it actually does a pretty decent job of explaining the rules. I would like to point out however that there are a few areas where the rules were a little redundant and seemed to make no sense. I had to reread a few paragraphs just to understand what was being said. Still, even with these minor issue, I think the book is good overall. Of course it wouldn’t hurt to have a few changes either. So far, this game has been like a mixed bag of nuts. You’ve already seen my mild displeasure with the components and my so-so feelings on the rulebook. As for the gameplay, that might be the one redeeming quality that saves this one. While it is a different take on the worker placement genre, it’s still a fairly good game. The worker placement feel is still there, it’s done through the use of the cards you play as your workers, along with the location that you place your workers on. Most workers have a certain location that they work best on, so utilizing them in these places will allow you to gain the most bang for your buck. Like any good worker placement game, the idea is how to best manage your workers and gaining the resources you need to complete Planning cards. Of course one thing that can really make or break you is the initial draft of Demon Workers. If you start off with the right group of workers that are able to play off of each other, then you can really get moving quickly. However if you pick a group that doesn’t work so well, it may take several rounds before you get your machine up and running like it needs to be, possibly costing you the game. Thematically the game makes sense. The cards really give off the vibe of that theme. However, as noted earlier, some pieces just don’t feel so thematic and really give you a feeling of disconnect from the theme. I’m also not a fan of games using Satan and Beelzebub in them. While I understand that it’s a game and that the artwork is very cartoonish, I think those characters could have been left out and something used in their place. I just don’t see the need for them in the game. I know that there will be some people that will disagree with me and may find nothing wrong with having the characters present. That’s simply something I feel every player has to decide for themselves. As it is, the game is not bad, I simply dislike the theme. Fans of worker placement games may enjoy this one, especially if they have no problems with the theme. For me, I can appreciate the mechanics and the thrill of the gameplay. I just disagree with the theme. I also think the idea of the game being for only 3 and 4 players is a bit odd. Sometimes I enjoy playing games with only 1 other person, yet this one doesn’t give me that option. You have to have 3 or more players and it really works best with 4. I prefer a game that scales well from 1 to many. Unfortunately this one doesn’t do that. Overall this is a game that I would recommend trying first. I don’t think everyone that enjoys worker placement games will like this one, but I think many probably will.